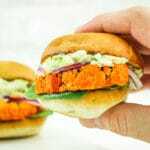 This Buffalo Cauliflower Sliders recipe is mind-blowingly delicious! Mini cauliflower steaks are roasted in buffalo sauce and topped with an irresistible blue cheese slaw. These are the perfect vegetarian game day recipe or cookout option! Thank you to Litehouse for partnering with us on this recipe! 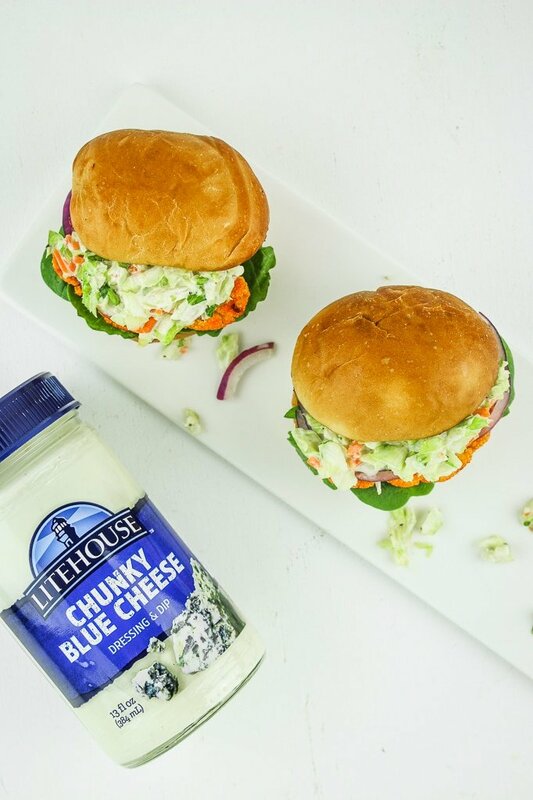 All thoughts and opinions are completely my own and I love using Litehouse Chunky Blue Cheese Dressing & Dip for these cauliflower sliders. Meet your new favorite finger food – cauliflower sliders! They are made with tangy, spicy buffalo sauce and topped with crunchy blue cheese slaw to cool it all down. These little handheld sandwiches of deliciousness disappear SO quickly once you set them out! I don’t know why cauliflower sliders are not ALL THE RAGE yet, but trust me, they soon will be. 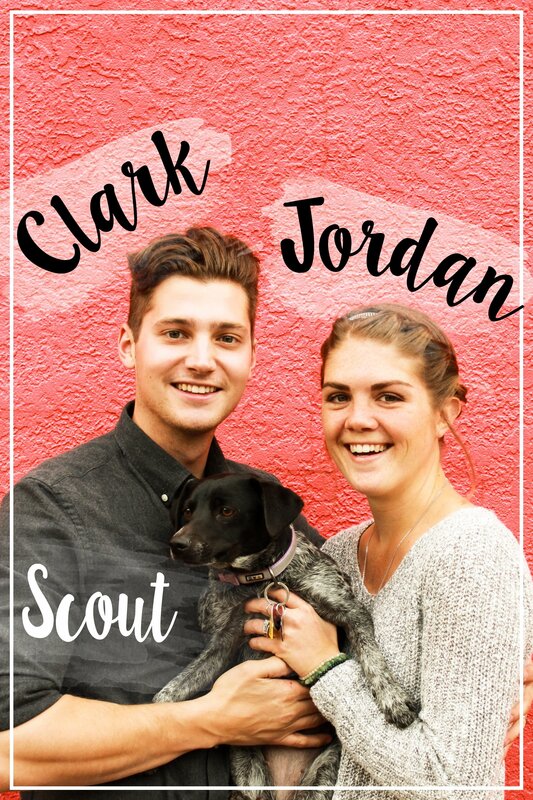 You’ll be seeing them at tailgates, on the menu at hip gastropubs, and fancy versions of them at upscale restaurants. 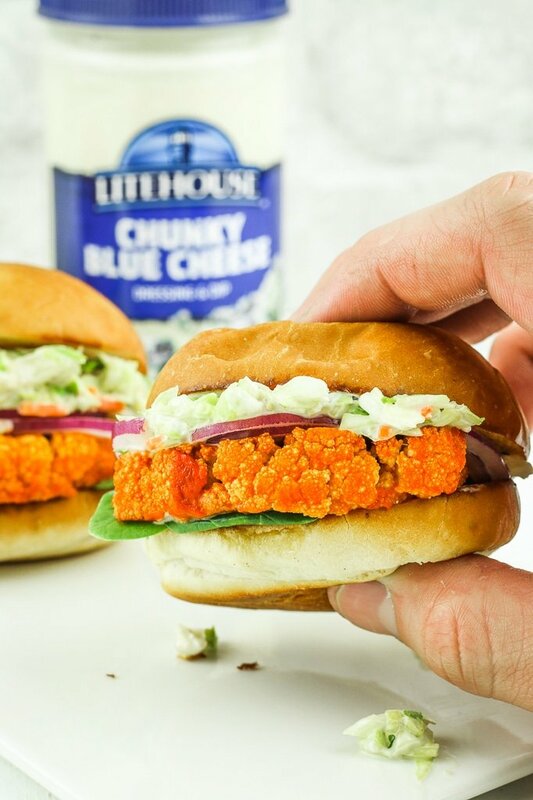 This particular take on cauliflower sliders is a combo of those two flavors that just go so perfectly well together – buffalo AND blue cheese. And my favorite part is that they’re EASY to make. Starting with a whole head of cauliflower, chop off the bottom stalk. Then, remove sections of florets, keeping them as large as possible. Select the largest florets and cut a cross-section horizontally down the center. Chop again to create a “slab” – these should be about ½”-¾” thick. Repeat the process until you run out of florets. Then, place them on a parchment-lined baking sheet. Sauce them on both sides, then roast for 30 minutes, flipping halfway. Depending on the size of your cauliflower “slabs,” place 2-3 on each bun and add the toppings of your choice. I love how cauliflower sliders are such a beautiful blank slate. You can do so many different kinds of sauces, toppings, and buns. For these, I used store-bought buffalo sauce, spinach and red onion, mini potato rolls, pre-made coleslaw mix, and Litehouse Chunky Blue Cheese Dressing & Dip. It’s gluten-free(!) and you can find it right alongside the produce in the refrigerated section. This stuff is PERFECT for the slaw-topping situation – it’s creamy and thick enough to hold the slaw together and keep it in place on the sliders. PLUS, you can pour the leftover dressing into a bowl and use it for dipping your sliders, veggies, wings, pizza, etc. Win-win! 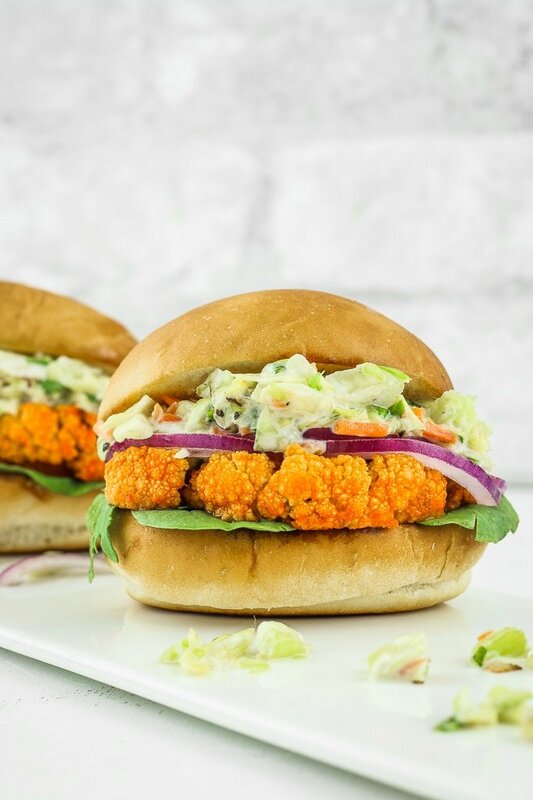 Whether you make these for game day, a cookout, or just a random friend’s night, these cauliflower sliders are going to blow people’s minds. It’s vegetarian food that people won’t even realize is vegetarian – and, it tastes AMAZING. I promise, even the carnivores will gobble these up. There’s a flavor party going on here and everyone is invited. And speaking of invited – Litehouse is hosting a sweepstakes for a chance to win a 65-inch flat screen TV! Go to LitehouseFoods.com and enter the “Big Game Big Flavor” sweepstakes from 1/18-2/9 (you’ll find the terms and conditions there as well)! When you make these cauliflower sliders, let us know! Leave a comment here or a picture for Instagram – we love to share your creations on our stories. I’m always looking for new and creative uses for cauliflower! With the spicy cauliflower and blue cheese dressing, this recipe has my name all over it! Going to keep this in mind for my vegetarian personal chef clients, too! 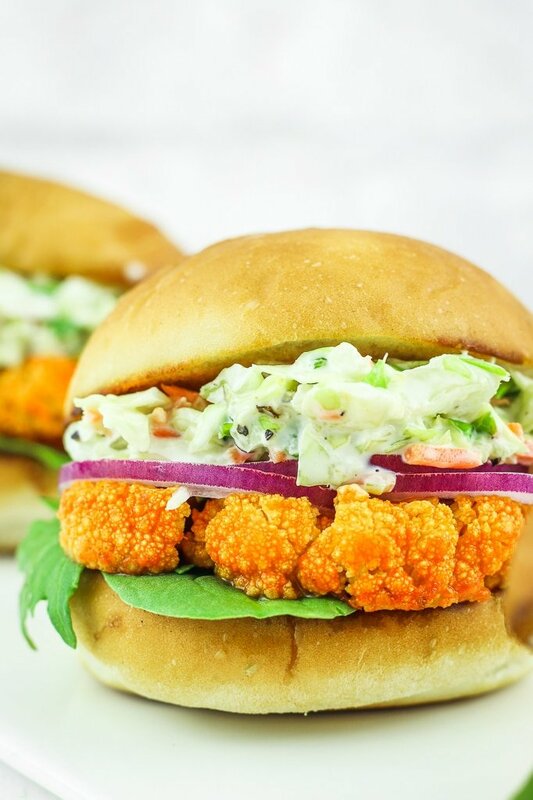 If you’re a cauliflower fan, you’ll definitely love these sliders! And I bet your clients would too. So cool that you’re a personal chef – you so fancy! I can’t wait to make these. I love all things buffalo ;) I know my kiddos would enjoy these as well. These are right up your alley! I hope you and the kiddos enjoy! These look incredible! Definitely, have to try this, I love the idea of adding in blue cheese too! Great idea. The blue cheese slaw is EVERYTHING on these sliders! 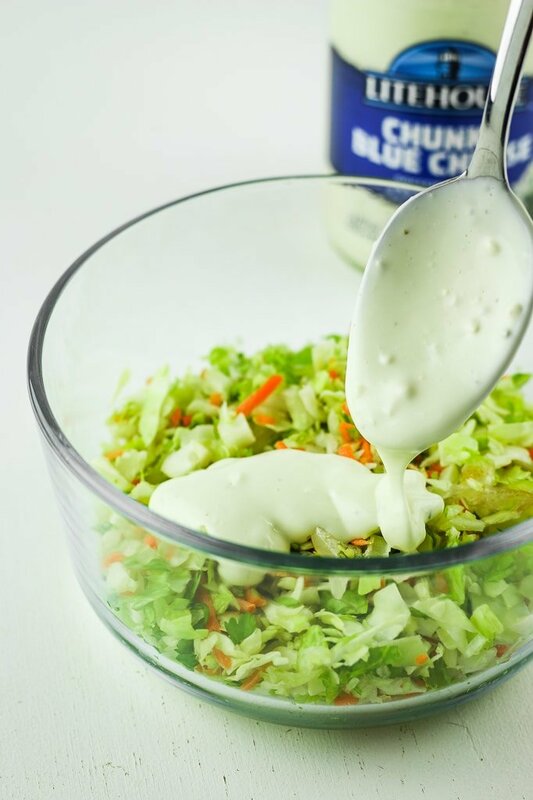 I can’t get enough of Lighthouse dressing, but I have never tried the blue cheese dressing. This sounds like a great vegetarian alternative to my regular sliders! You have to try their blue cheese! It makes the slaw on these sliders freaking amazing! These sandwich look delicious! 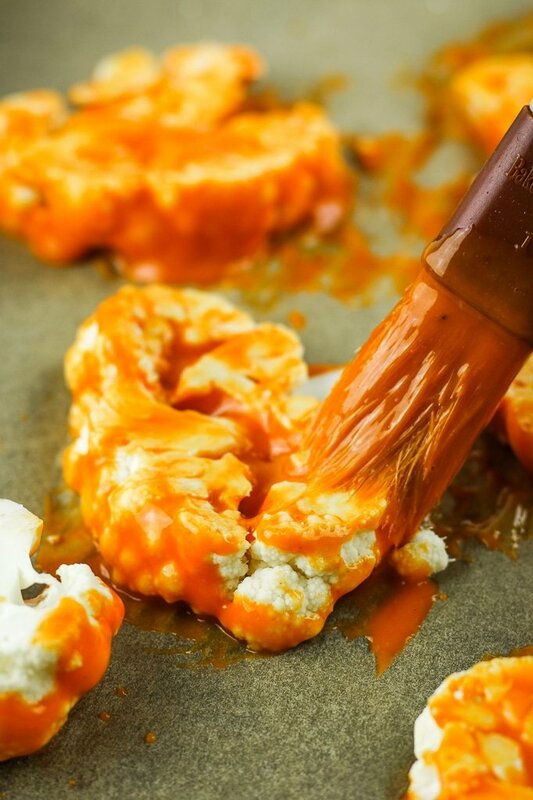 I love buffalo cauliflower, but have never though to make it into a sandwich, great idea! Oh it’s the best! Cauliflower makes such fantastic sliders! Sliders are one of my favorite dinners. I love that they are vegetarian, perfect for meatless Mondays. Yes! Definitely a great meatless Monday option. Let me know what you think! So fresh and bright – the perfect food for a weekend party! I agree! These would be awesome for little get togethers or game days! THESE LOOK SO GOOD! I love using cauliflower in place of meat. And that blue cheese slaw is calling my name. Great recipe! Yussssss!! You are gonna love these! All things buffalo for me ALWAYS. The slaw is really the home run in this recipe! Perfect way to balance it all! Agreed! Gimme alllll the buffalo! Yes! Buffalo is great on cauliflower – you must try it! I’m always looking for new ways to incorporate more veggies into my diet that aren’t salads. These sliders are perfect! Can’t wait to feed them to my hubs this weekend! Same here! This is such a fun way to incorporate more veggies. Hope you and hubby enjoy! The flavour combination of buffalo seasoned cauliflower and blue cheese coleslaw is mouth watering! This might be one way to get my husband to eat cauliflower! I promise your husband will like these! They’re SO good! These look insanely good! I would never think to use blue cheese for a slaw but I am trying these ASAP. Probably not waiting for game day lol. Ha! Life’s too short to wait for game day!